The Philippine and the North Borneo question by Pacifico A. Ortiz, 1963. This book explains the political, historical, and legal cases of the Philippine claim to Sabah, relying on government documents, press articles, and archival records. It also examines the different treaties signed by the sultans of Sulu and the Spanish government in 1836, 1851, and 1878, all of which help explain Sulu’s sovereignty over Sabah. It discusses the political and legal maneuverings of colonial powers like Spain, the US, and Britain over its Asian colonies for the sake of more land and power. The Appendices include three versions or translations of the deed of 1878, written in Malay in Arabic characters, indicating that the Sultan of Sulu has leased Sabah to businessmen Gustav von Overbeck and Alfred Dent. The book also has a map of North Borneo, published in 1933 and amended in 1962, with an inset of a map showing the Philippines, Indonesia, Thailand and Burma, and New Guinea. Philippine claim to North Borneo Vol 1, Manila: Bureau of Printing, 1963. This book contains an excerpt from President Diosdado Macapagal’s State of the Nation message to the Congress on January 23, 1963, explaining that the Philippine claim to Sabah was being pursued in the interest of national security: if Malaya (which would later be incorporated into the Federation of Malaysia) were to be a communist country, with North Borneo under its jurisdiction, “there would be created a situation in which a communist territory would be immediately at the southern frontier of the Philippines, which would pose a grave and intolerable threat to our country.” The book also includes the statement at the opening meeting of the British-Philippine talks in London in 1963. Between the second and third chapters is a foldable map of Southeast Asia showing “how essential North Borneo is to Philippine security,” North Borneo being only eighteen miles away from the nearest island of the Philippines. Chapter Three discusses the historical and legal bases of the claim; while the Appendices consist of thirteen historical documents as well as the different versions or translations, including Spanish, of the 1878 lease. Symposium on Sabah by Carmen Guerrero Nakpil, Manila: The National Historical Commission, 1969. The booklet collects the following lectures delivered in the symposium organized by the National Historical Commission on the Sabah question: “English trade and politics in the Mindanao Sulu area: 1684-1888” by Serafin D Quiason; “The Sulu Sultanate and its original acquisition of Sabah” by Cesar Adib Majul; “The Philippine claim to Sabah: legal aspects” by Ethelwoldo E Fernandez; “Historical aspects of the Philippine claim to Sabah” by Armando D Manalo; and “The Sabah question: prospects and alternatives” by Rolando N Quintos. Philippine policy toward Sabah: a claim to independence by Lela Garner Noble, Tucson, Arizona, Published for the Association for Asian Studies by the University of Arizona Press, c1977. This book analyzes the Sabah issue from a foreign perspective, working on the assumption that the pursuit of the claim to Sabah is simply the Filipinos’ attempt to demonstrate their independence to the world “to improve their national image.” Noble concentrates on the development of Philippine policy on Sabah based on national image, as well as on the British and Malaysians’ perceptions of this image. The book tackles the different policies on Sabah from 1962, when “pro-American” president Diosdado Macapagal rose to power, to the 1970s, when Ferdinand Marcos, in the country’s attempt to consolidate more with the ASEAN, backtracked and declared that he intended to drop the claim. The book discusses all the documents, incidents, and discussions relevant to the case from the nineteenth century until 1976, including the Bangkok talks and the so-called “Jabidah Massacre” of 1968. Sulu and Sabah: a study of British policy towards the Philippines and North Borneo from the late eighteenth century by Nicholas Tarling, Kuala Lumpur: Oxford University Press, 1978. From the book jacket: “This book…is concerned primarily with the making of British policy towards the Sulu-Sabah region. It is based largely on British documents, and throws light on British attitudes towards the other Europeans in the area, and towards the indigenous states of Southeast Asia, during the late eighteenth, nineteenth, and twentieth centuries. The book may also make a contribution to the study of the Malay sultanates and their reactions to the West… . Finally, the author offers some observations on the Philippines claim to Sabah and suggests some ways in which the problem might be resolved.” The book’s historical discussion of the Sulu-Sabah region stretches to as far back as the 1500s, when Spanish colonizers first arrived in the area. Readings on the Sabah question, Quezon City: International Studies Institute of the Philippines, 1987. This compilation of materials reflects how the issue of Sabah has remained a subject of national controversy in 1987. The compilation presents opposing views, such as Sen. Lorenzo Sumulong’s “A report on Malaysia and on the greater Malayan confederation in connection with the Philippine claim of sovereignty to a portion of North Borneo,” and Cong. Jovito Salonga’s reply to that report. It presents a comprehensive history of the Sulu sultanate by Santanina T. Rasul. The collection also includes selected documents relating to the Philippine claim to North Borneo, some of which have previously appeared in Philippine claim to North Borneo Vol 1. These documents include diplomatic correspondence between Filipino and British officials in 1962; statements and communiqués from the London talks of 1963; and the relevant historical documents such as contracts, letters, and agreements among colonizing and colonized officials. Sabah: 25 years later (1963-1988), edited by Jeffery G Kitingan and Maximus J Ongkili, Sabah: Institute of Development Studies, 1989. Published to “commemorate the twenty-fifth anniversary of Sabah’s independence within Malaysia,” the book contains thirteen essays on Sabah’s political, social, and economic growth in the context of Malaysia’s history as a young, newly independent nation starting 1963. It covers the development of administrative, welfare, and medical services in Sabah; the building of houses, schools, museums, and libraries there; and the economic, cultural, and demographic landscape of the place. The Philippine claim to Sabah has not been mentioned anywhere in the book. Among copies of maps in the library is that of A chart of the passages between the Philippines and the Isles of Borneo and Mindanao with those to the Southward of the Sooloo Archipelago and the Isle of Mindanao, by Robert Laurie & James Whittle, London, 1799 (SC00490 in Retrato). 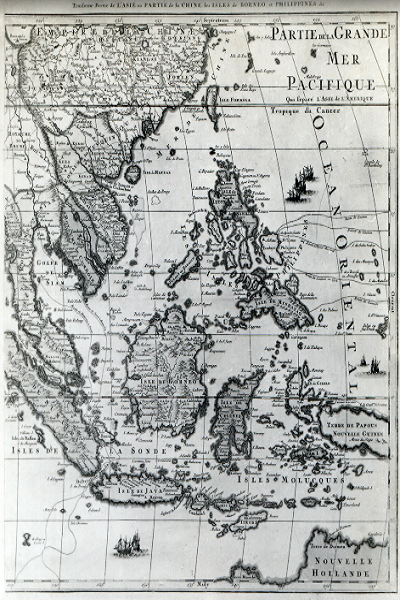 Another map showing the proximity of Sulu to Borneo is Third part of Asia, or part of China, the islands of Borneo and the Philippines, etc., 1700 (SC00257 in Retrato). FHL also has a copy of a topographic map of Borneo, circa 1600 (SC00271 in Retrato).